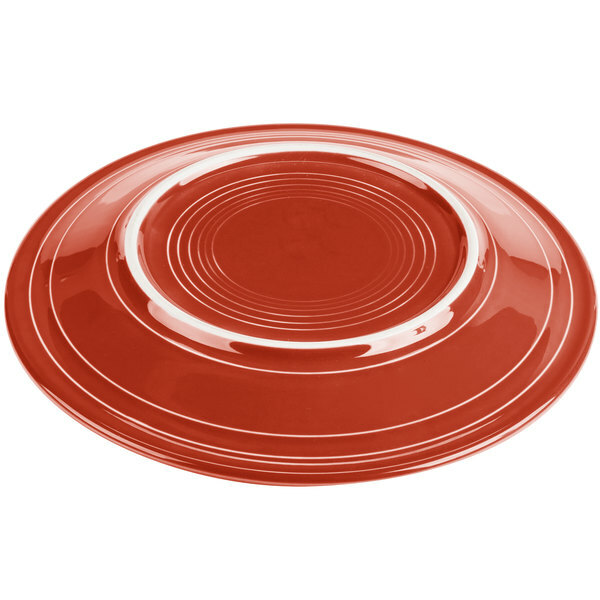 Showcase your freshly-prepared entrees and decorative arrangement of sides with this Homer Laughlin 466326 Fiesta scarlet 10 1/2" dinner plate! Thanks to this plate's concentric design, your guests' eyes are drawn to the scrumptious food. Plus, this contemporary plate adds a splash of color to your restaurant, catering business, or hotel. 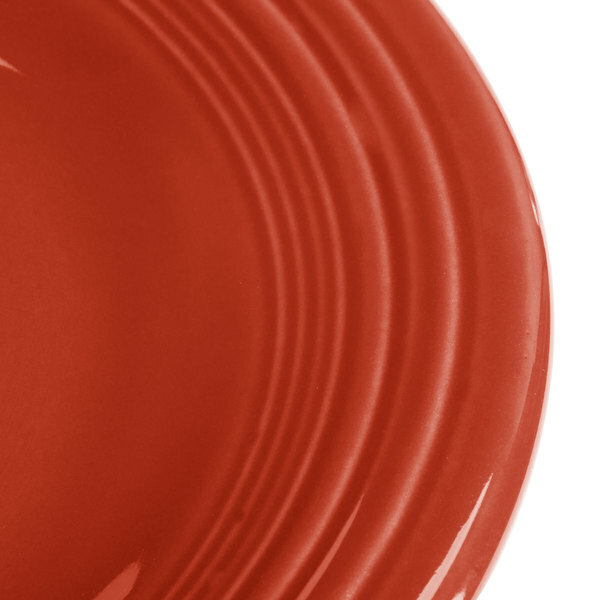 Its luminous, lead-free glaze and scarlet color complements the decor of your kitchen or restaurant atmosphere. Homer Laughlin's Fiesta line offers an extensive variety of colors, so you can stick to your favorite hue or mix and match colors! This plate is oven safe up to 450 degrees Fahrenheit. Therefore, you can reheat premade food in the microwave or keep freshly prepared meals hot in the oven until ready for serving. Then during clean-up, you can save your staff's precious time and energy by conveniently placing this plate in the dishwasher. In no time, your plate is thoroughly cleaned and ready to use again! To prevent moisture absorption, the Fiesta line is fully vitrified. This piece contains Alphalain® which is made up of alpha aluminum material. Alphalain® helps to reduce chipping, breakage, and scratches commonly caused by the wear and tear of everyday use, while enhancing durability and also providing superior heat retention. For outstanding quality, look no further than Fiesta. Introduced in 1936, Fiesta dinnerware was an immediate hit! 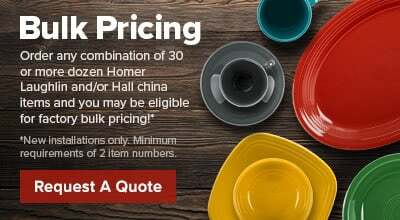 Today, its iconic concentric rings, high gloss finish, and vast array of available colors make it one of the most popular and recognizable dinnerware patterns worldwide. Making quality china in America since 1871, all Homer Laughlin products are built to last! To further support this quality, the entire Fiesta line is backed by a lifetime, no-chip warranty. Made from 100% recyclable materials. 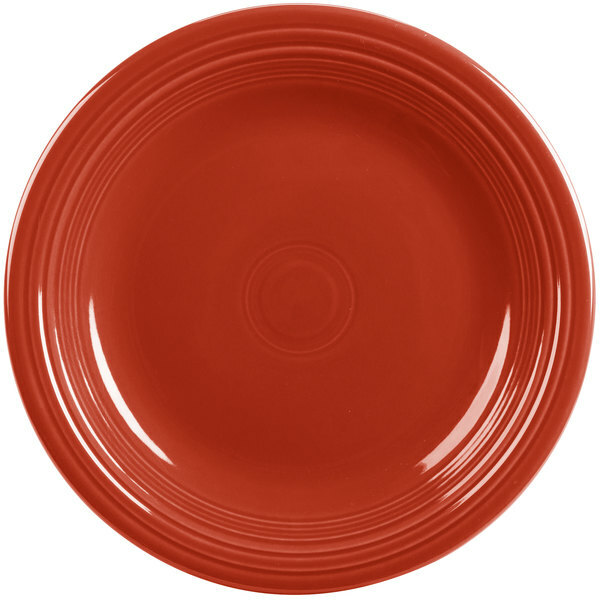 Extremely pleased with these dinner plates..well made and just love the color scarlet. I have been collecting Fiestaware for over 20 yrs and now my daughter is ongoing this tradition. A True Red Plate!!! Homer Laughin guarantees their plates from chipping. I use these commercially and have been very pleased. They wear and wash well. 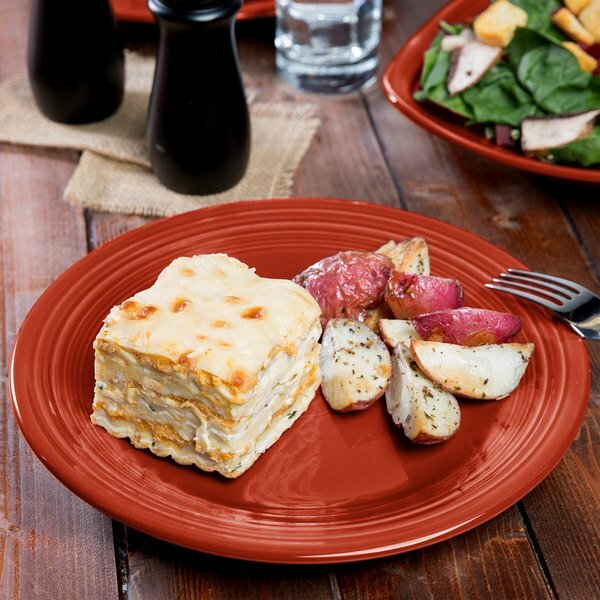 Fiesta dinnerware made by Homer Laughlin is a fantastic product line! Each piece is chip resistant and holds up to lots of wear and tear even with constant use. Plus, these plates make food look even more delicious! These plates look so good and the best part is the are nearly indestructable. Couldnt ask for more than that! I will continue to order these plates whenever we need to restock our inventory.